Today I have a layout to share with some tips on how you can layer on your layout to create a very eclectic, fun look. 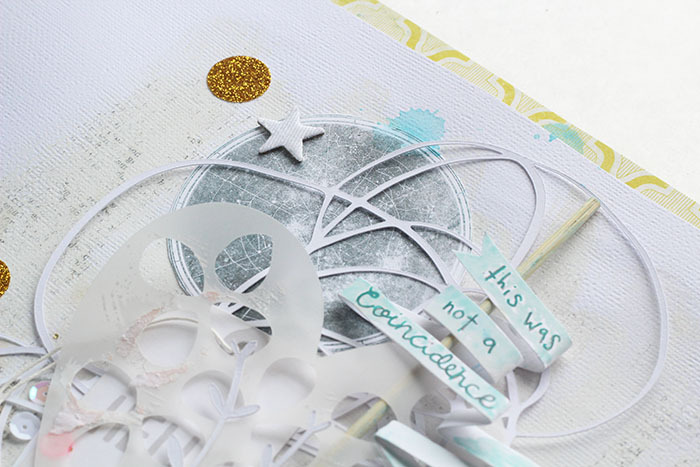 This page is one that came together quickly using bits and pieces and scraps on my desk.. and then sat for quite a long time while I decided whether or not it was done! 1. Choose a neutral colour scheme. By mixing neutrals or colours of a similar hue, you're guaranteed that your layers will mix and match and look cohesive. Here I chose primarily whites, and added in a tiny bit of colour in yellowy greens, gold, and just the tiniest touch of pink. 2. Choose a variety of layerables. 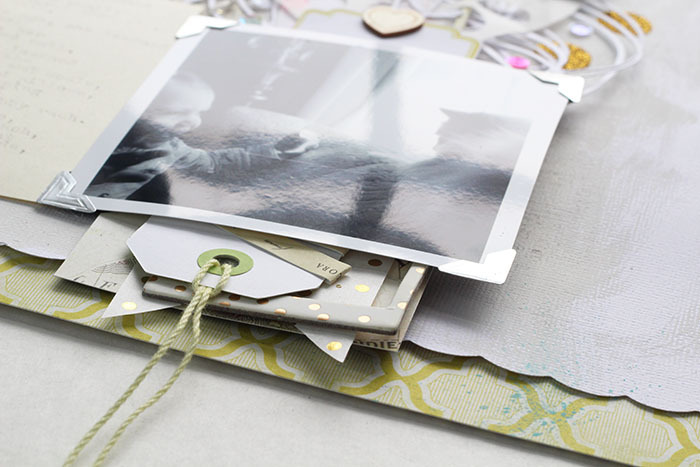 Don't be afraid to mix scraps, frames, tags, and whatever else catches your fancy! The more you add, the more collected it will look. Keeping a dish of scraps on your desk is a great source of layerables! 3. Choose a variety of paper types and finishes. Gather a mix of heavier and lighter weight papers. Don't be afraid to mix in see-through bits, like a lacy cut file, open frame, or vellum pieces. Remember, because you've chosen a neutral colour scheme, these varied pieces are going to work together! 4. Consider an off-balance design. When layering under a photo you can choose to have more layers showing on one side versus the other. This off-balance layering can be striking, and invite your viewer to really delve into those layers and check them out. Here, I've helped balance my top-heavy design by using lighter and airier layers on the top of the page, and more solid layers that peek out just under the photo a bit. 5. Add in something unexpected. Not all of your layers need to be fully visible! Some sequins or confetti spilling out from *between* the layers adds a lot of interest and invites a sense of curiosity... and makes your layers look much more organic or natural. Here, I've even partially obscured a tag with a "hello" sentiment printed on it behind an eyelet lace vellum heart. This peek-a-boo effect really creates a sense of whimsy! I created a title on a long wavy banner wrapped around a skewer, and hand lettered the words in liquid ink. A light wash of water colour helps it stand out from the delicate background layers without adding too much contrast. Large gold glitter polka dot stickers add a nice bit of sparkle! This constellation map was a tester image with one of my Cocoa Daisy stamps... it was a second generation impression so the ink colour is lightened and the image is a bit distressed. It was perfect behind these whimsical layers! Once my page was finished the blue title was noticeably blue as it was the only blue item on the page... two single drops of blue watercolour near the top of the page really helped bring a bit of blue to the background and made the title look more cohesive with the rest of the page. I love that all of the neutral layers and light background helps create a light, pale coloured page, even though there is still small dashes of colour here and there -- neon pink, gold glitter, citron/yellowy green, and a bit of blue! These chunky layers under the photo are fun... but it looks like I need to add some foam dots under the photo corners to accomodate the bulk! For more photos... of kids, cats, coffee cups and scraps... and daily peeks at my desk and my life... follow me on Instagram. SUCH an awesome set of tips for layering! I follow this, but didn't realize that I was doing so until I read this. Great layout...love all the layers and the colors. Thanks for your tips for layering! 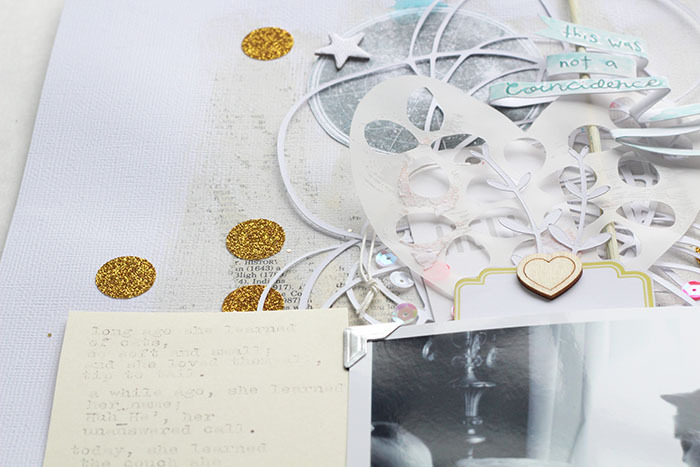 Such a fun and whimsical layout and great thoughts on layering! 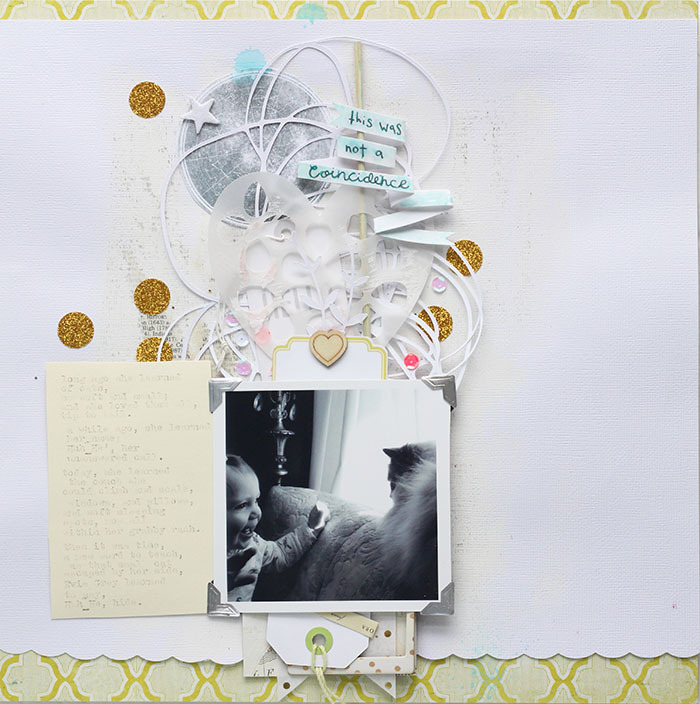 Great tips and lovely layout! Great tips. 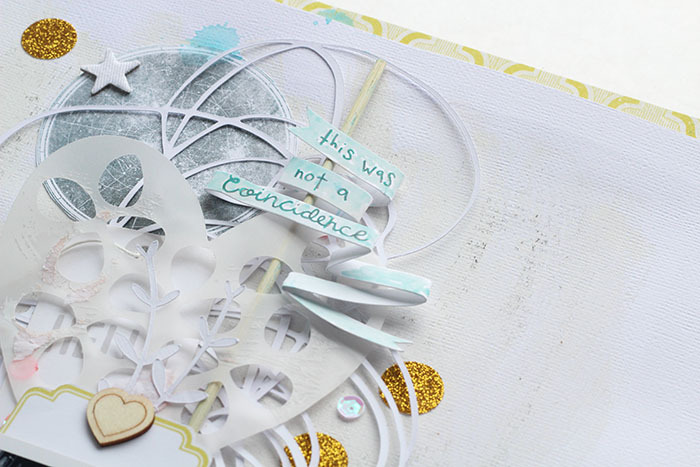 I love the idea of layering in vellum die cuts with white and other little things poking out! Great post!